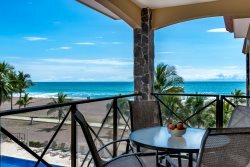 Bahia Azul is a charming beachfront condominium complex that offers a fantastic location, ideal for groups and families, with amazing oceanfront and pool views. The stunning complex is comprised of 10 buildings with 3 units per building and one unit per floor which surround a stunning ocean front free forming pool. Situated near the south end of Jaco Beach and only an hour and a half drive from Juan Santamaria International Airport, it is a perfect spot for a vacation. It is set amid a backdrop of pristine rainforest and looks out onto the Pacific Ocean, only a 5-minute walk from downtown Jaco.